The Basement Crew visit Galaxy Collectables in Brooklyn where they were challenged to a geek-off by the shop's mysterious manager Tom. Someone got schooled, watch and find out who! The Secret Invasion is well on its way and the boys dissect who they think is really a Skrull and who's not. Wait a minute since when does Steve wear a hat and Pete wear a white t-shirt? Ramon's burping and Adam's cursing? Is one of them a Skrull? It was a good week. Somehow better then Ultimate week. That's not even including Secret Invasion. There are SPOILERS. A girl finds her way into the Basement. Is she real or just a figment of their collective imaginations? 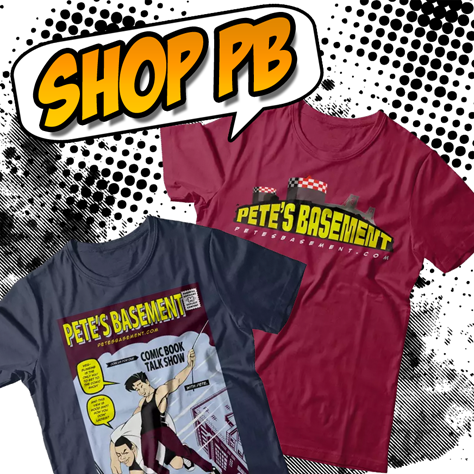 Join Pete, Adam, Ramon, Steve and special guests a-plenty in this very-special, elongated, that's right, elongated episode of Pete's Basement! Are you in the Basement? Ok it was a good week again. Let's just get to the point. Danny Sanchez joins the basement while Adam has his lungs removed. Steve reveals the first of his "Characters That Never Should Have Been Created". Pete relays the joys of eBay categories and keywords.